Contrary to misleading headlines, the salmonella outbreak at three Foster Farms chicken processing plants was not due to the federal government shutdown. The spread of antibiotic-resistant salmonella is directly due to corporate industrial processing of supermarket chickens. These operations routinely process and sell poultry infested with poisons and toxins, including e.Coli. As explained here two months ago in "Supermarket Chickens Laced with Bacteria, Feces, Chemicals:"
"I used to stock-up on chickens at cheap prices and freeze them for future use. Five years ago, I roasted at least two supermarket birds weekly to feed my then family of three. No more. Today, I'm nauseous at the thought of buying, handling, and particularly serving these contaminated industrial food products. As of last week, 317 people were reported by the USDA as very sickened by Foster Farms chickens processed at three California plants. Half of the 317 were hospitalized. The public health rule-of-thumb is that 20 people are sickened for each officially reported illness from contaminated food. Foster Farms has been charged before with producing infected chickens destined for supermarket sales. Yet the USDA continued to allow Foster Farms to sell its tainted products. "The USDA knew it needed to address this problem urgently, says the report, so in December 2012, the “USDA-FSIS announced that all establishments producing not-ready-to-eat ground or comminuted poultry products, including Foster Farms, will be required to reassess their Hazard Analysis and Critical Control Points plans. 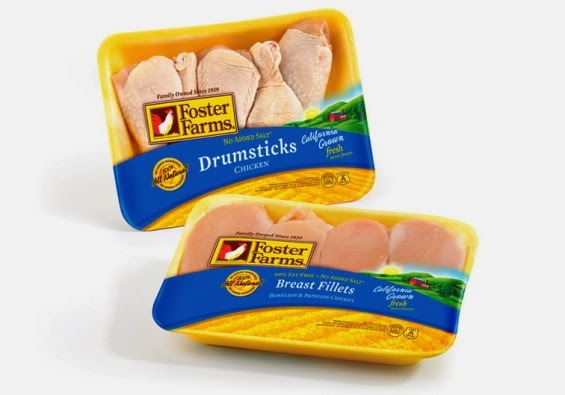 The USDA-blessed fix for Foster Farms' latest sickening of consumers? "Well, we hope so. Meanwhile, commerce continues and the chicken is out there. Will it be taken off the market after 800 people get sick? Or 1,200? Or when someone dies?" 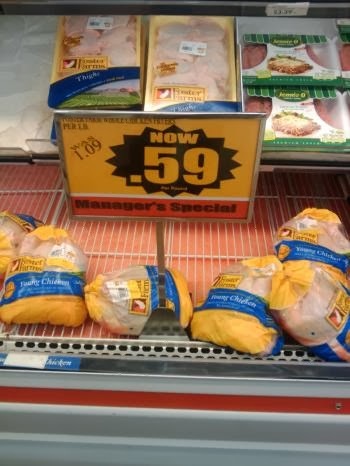 Is this latest widespread incident of public sickening from contaminated Foster Farms chicken over? We, the American public, do not know. Results of extensive lab testing by Physicians Committee for Responsible Medicine "revealed that 48 percent of all chicken samples tested positive for feces." Read Supermarket Chickens Laced with Bacteria, Feces, Chemicals for succinct info about how each of the four steps in industrial processing of chickens contributes to contamination of poultry sold in supermarkets across the nation. I also offer suggestions on buying uncontaminated chickens at butcher shops, Whole Foods stores, and the like. And please... for your health and that of your loved ones... bypass supermarket chickens. They're a particularly disgusting food product of the industrial fake-food industry, whether or not the federal government is shutdown. This is a great resource for finantial market. I like your website very surely. Thank's very much for this website. If you want more informastion about stock watch to visit stock watch Keeping a stock watch list can be a critical for a trader. There are many different reasons why statement is true. First things first, what exactly is a stock watch list? This is a list of stocks that you feel are good strong companies for whatever reason. It may be that these companies have strong earnings and the company itself is a good investment.